This national monument is home to three majestic natural bridges that were carved from the rock by water. Overlooks connected by a scenic drive give visitors an easy way to view the bridges. For the adventurous, there are trails that lead from the top of the mesa down to the bridges. Cost: $6 per vehicle. Camping is $10 per night. Operating Seasons and Hours: Open year round. The visitor center hours vary slightly based on the season, but basically it is open from 9:00 am to 5:00 pm. This was the second stop on the fifth day of the Southern Utah Road Trip that my husband and I went on for our anniversary in May of 2010. 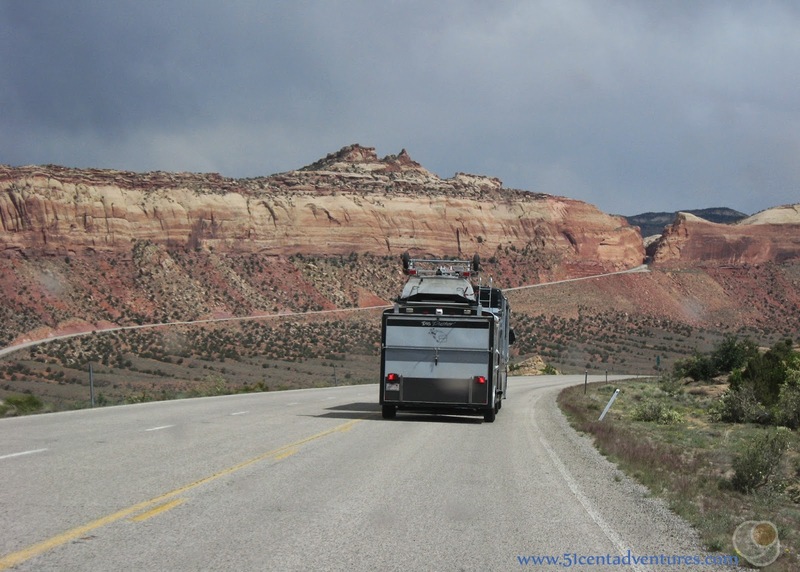 We left the Hite Marina area of the Glen Canyon National Recreation Area and continued driving southeast on Highway 95. We drove for another 41 miles and came to the Natural Bridges Visitor Center. When I started planning our road trip I had a pretty good idea of what places we would visit. Some of them were places Brandon or I had been to before we met each other. Other places were ones that I'll put on my mental list of places to see. Finally, there were a handful of places that I'd never heard of until I started planning out our route. Natural Bridges National Monument was one of those places. As I read more about the area I was surprised that I hadn't heard about it before. There are three stone bridges within 9 miles of each other. That's pretty impressive. I guess the reason I'd never heard about the national monument was because the area is a 6 hour drive from my home town near Salt Lake City. I don't remember ever hearing anyone talk about taking a trip all the way to that area of Southern Utah. I felt kind of like I was heading into uncharted territory by planning a trip to see the natural bridges. When we arrived, Brandon and I stopped at the Visitor Center first. There wasn't anything to hold our attention so we went back to our Jeep. We started driving the one way loop road that connects the viewpoints for all three bridges. I think one of my favorite things about this national monument was how easy it was to see the bridges. The one way road runs along the edge of a mesa. Each of the three bridges is visible from overlooks on the edge of the mesa. The hardest thing was actually seeing the bridges. They didn't stand out against the stone behind them. In some ways the scenery reminded me of those magic eye 3D pictures. You know, the ones where you stare at a bunch of random shapes and colors until your eyes slide into focus and an image pops out. That's what it was like to try to see the natural bridges. I'd look around at the scenery and just see canyon walls. Then my eyes would start to pick up on little details and suddenly a bridge would pop into view. We had planned to hike down to the base of each bridge to get a better look, but unfortunately my body had other plans. I was 11 weeks pregnant with twins. Though I'd done a bit of hiking on the first three days of our trip, I wasn't feeling up to it on this day. Brandon and I told ourselves that we were scouting this location for when we would come back with our children. You can bet that when we do go back we are going to do a lot of hiking. This post is a guide of what you can expect to see from the overlooks on top of the mesa. 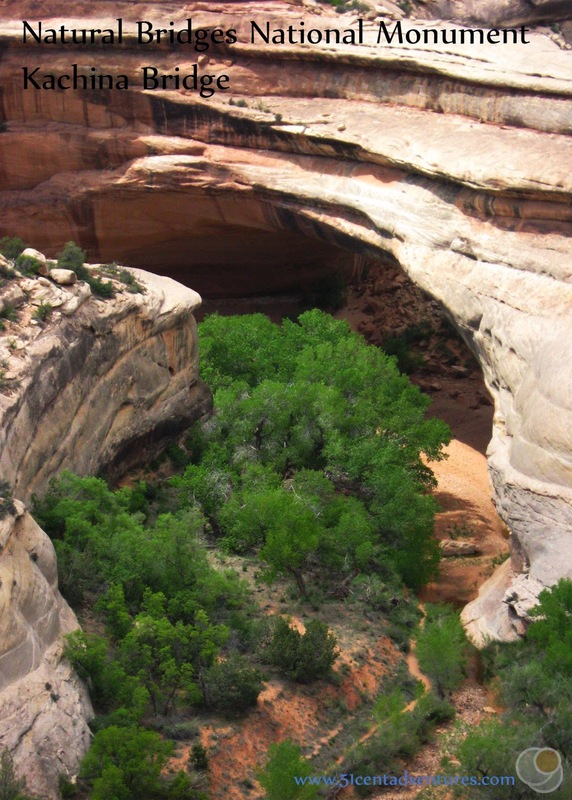 Consider this your non-hiking guide to Natural Bridges National Monument. I definitely want to come back and hike through this area one day. I'm sure that seeing the bridges from ground level is even better than seeing them from up top. There is a 9 mile loop trail that connects all three bridges. I think it would be a great place for a backpacking trip. You could check off your progress with a bridge every so often. Before I show you the pictures of the bridges we need to talk about the difference between an arch and a natural bridge. The difference is in the way the opening formed. A natural bridge is formed by water cutting through the rock. An arch is formed by other erosion forces such as wind, freezing and thawing cycles, and rain. Basically a natural bridge is an arch that was formed by water flowing under it. 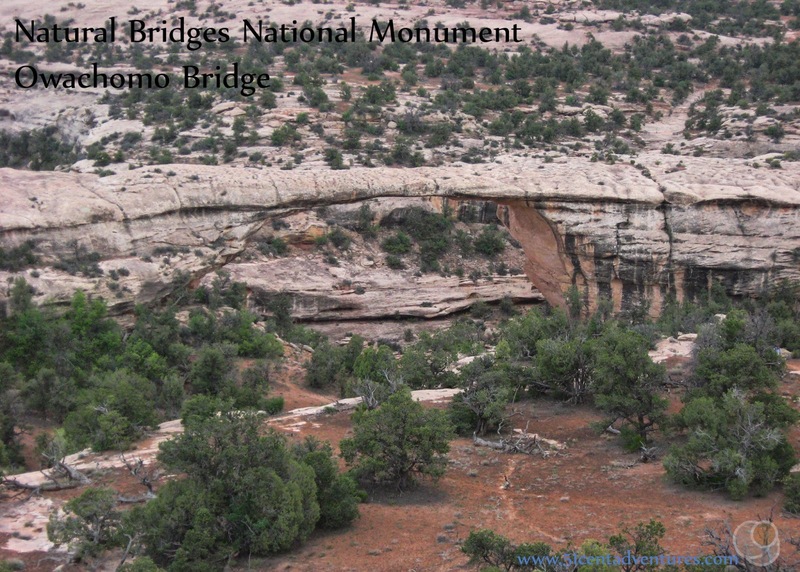 So all the bridges in Natural Bridges National Monument were formed by the small river which still flows under them today. The next area of interest after Sipapu Bridge is the Horsecollar Ruin. This is a well preserved remnant of an Ancestral Puebloan (Anasazi) cliff dwelling. A kiva and two graineries remain. They are visible from an overlook on top of the mesa. You have to walk a short distance along the top of the mesa to get to the overlook. I don't remember why, but we didn't stop at this spot. I must have really not been feeling well to not even want to walk a little ways on a level trail to see ancient ruins. 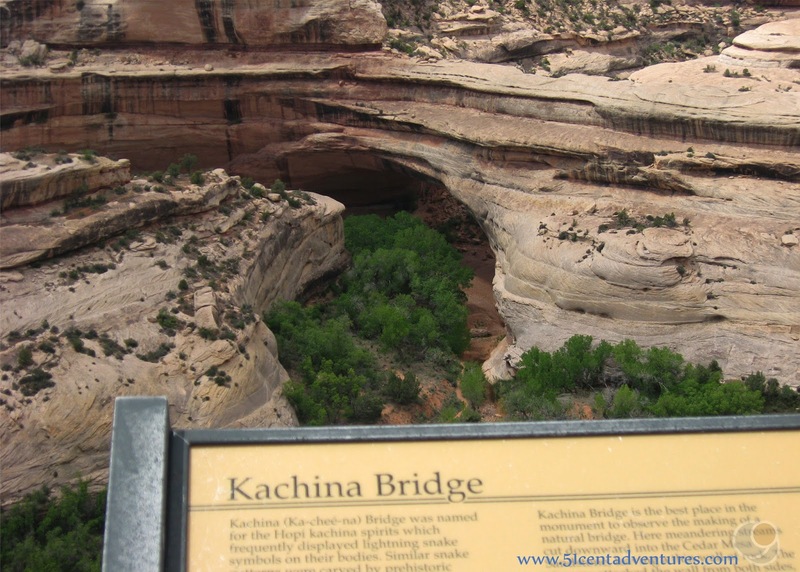 The next bridge is Kachina Bridge. Kachina is named after the Kachina dolls which are important to Hopi Mythology. There is rock art drawn onto the bridge that resembles symbols used on Kachina dolls. At least that's what the park brochure said. I couldn't see any pictographs from the overlook. This bridge was originally named Senator. You might be impressed by how well I remember the names of each of these bridges. I'm actually going to let you in on a secret. I totally cheated. Or rather Brandon cheated for me. He took a picture of each bridge with it's informative sign in the shot. It's a nice trick to keep track of what you've seen on your vacation. We also sometimes take pictures of the informative signs that are always around areas of interest. That way we can remember details about the things that we've seen. I use this trick a lot now that I have children. My kids don't like waiting around while I read signs. It's easier to just take a picture and read the information later. 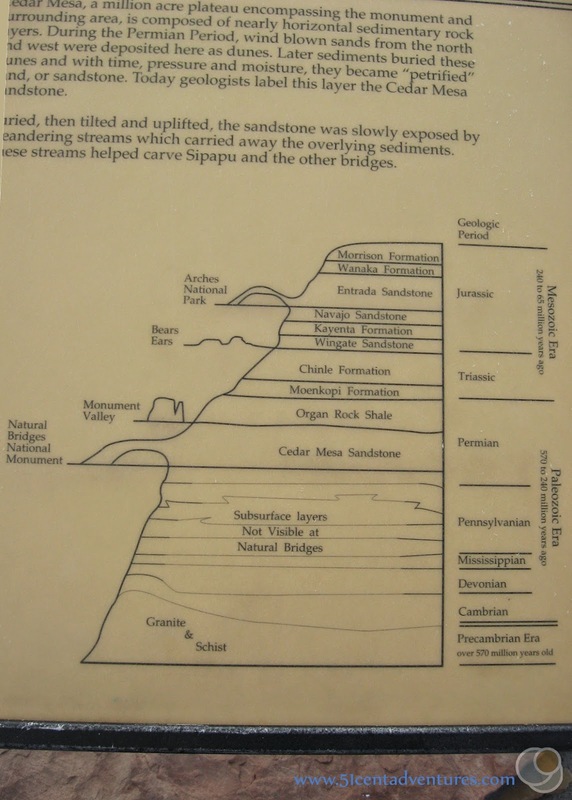 On this trip to Natural Bridges I appreciated the information in this graphic that explained the different sand stone layers and what famous features they helped form. This is one of my favorite pictures of myself from this road trip. Even though I wasn't feeling well enough to go hiking, I was still having a great trip. I had looked forward to this vacation since returning to work after Christmas was over. I was happy to be away from my office and enjoying nature. Owachomo bridge is the last of the three bridges. Owachomo means "rock mound" because of the rock mount on it's east abutment - which I don't see in this picture. It was originally called Congressman. It is the thinnest of the three bridges. That means it the oldest by bridge standards. 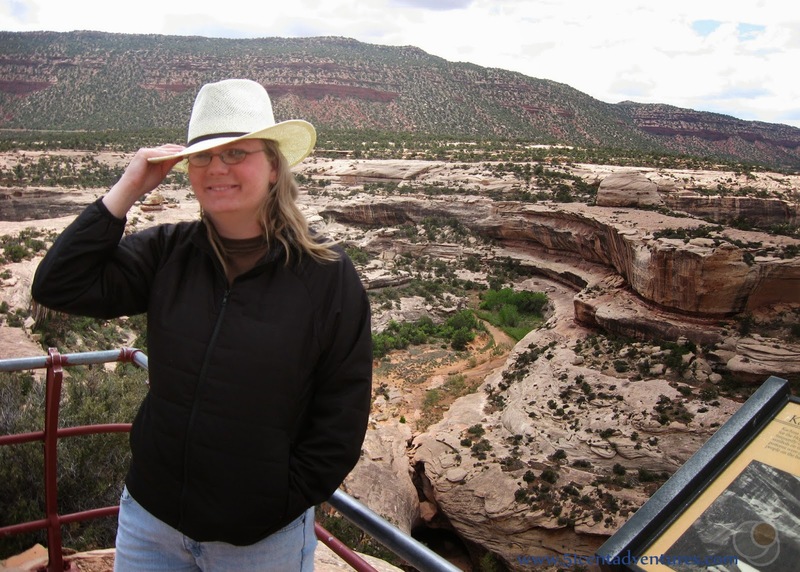 Places like Natural Bridges National Monument are the reason I love having this blog. This place was fun to discover and explore. I'm glad that I can share my visit to it with people like you. Hopefully I've inspired you to check this place out when you are in the area. 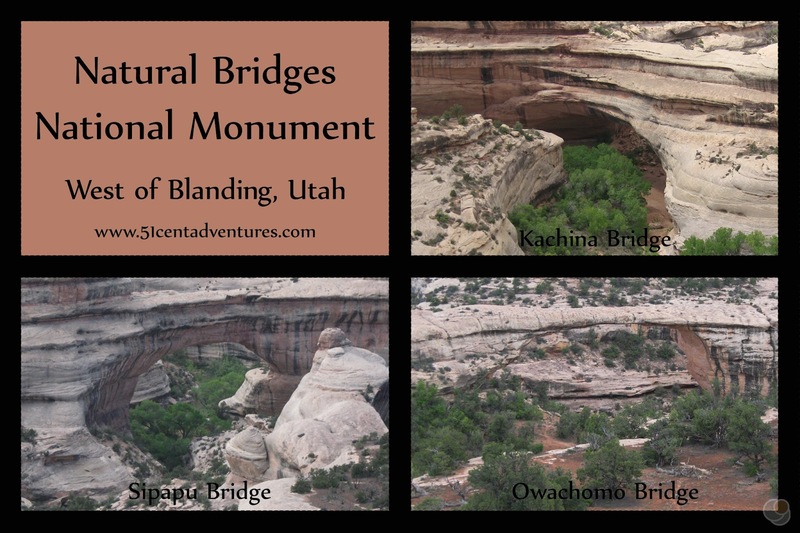 Recommendation: If you are in Utah's Four Corners area you should definitely make time to see these three stone bridges. 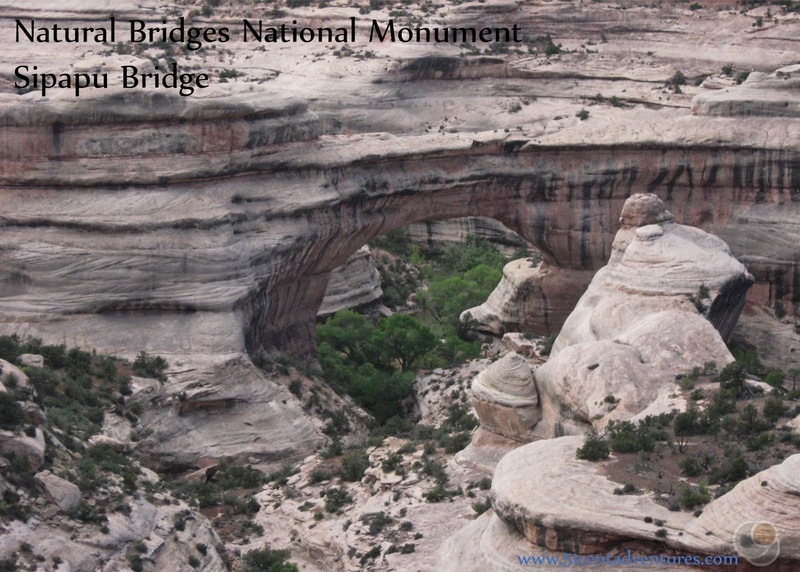 Directions: The turn off for Natural Bridges National Monument is located along Highway 95. The monument is 40 miles west of Blanding Utah. 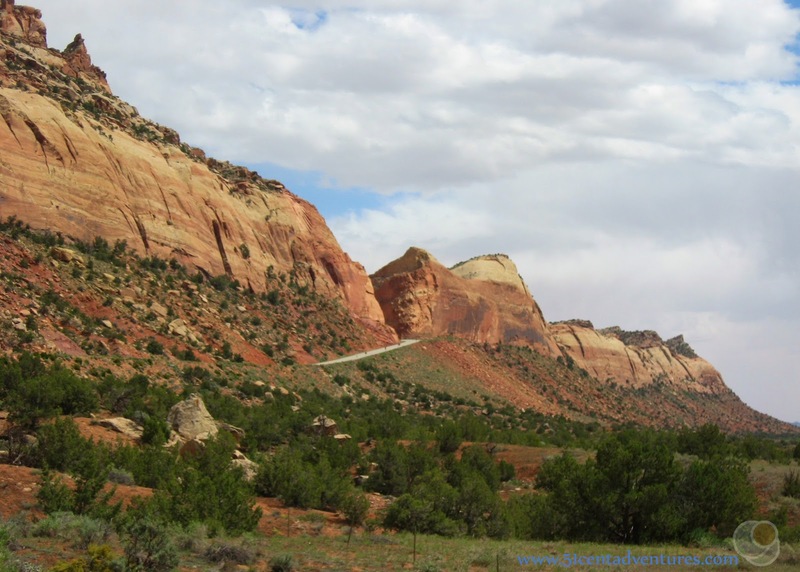 Places Nearby: As with most of Southern Utah, the drive along Highway 95 from Natural Bridges National Monument to Blanding, Utah was pretty interesting in it's own right. The road map that I used on this trip didn't have any elevation changes marked on it, so I was very surprised when the road seemed to be heading toward a huge rock wall. As we got closer I could see a narrow canyon through the wall. The rock wall is known as Comb Ridge. It's 80 miles long and reaches heights of 700 feet in some areas. I didn't know it at the time, but the Butler Wash Ruins are located very close to this area of Highway 95. The ruins have several structures including 4 kivas. The trail to the ruins is only 1 mile round trip. For even more information about Comb Ridge check out this fascinating article about a group from National Geographic that decided to traverse the length of Comb Ridge. More Nearby Places: Sometimes it seems like this trip was characterized by what we didn't see. There were so many routes that we could have explored on this trip. In this case we could have continued south to Goosenecks State Park, or pushed on even farther south to Monument Valley. But as always, there just wasn't time. Exploring those parts of deep deep southern Utah would have to wait for another trip.